World Soccer Shop is proud to announce the arrival of the brand new AS Roma soccer jerseys for the ‘08/09 season. The Home/Away and Third Kits! 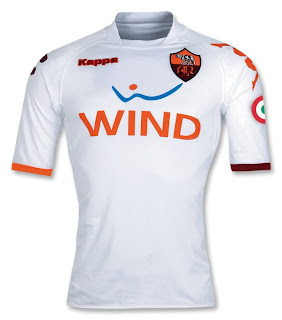 Official Associazione Sportivo Roma Short Sleeve Home Soccer Jersey from Kappa. The new jersey features Roma's colors of maroon red with a golden yellow trim representing the traditional colors of the Eternal City, the official seal of the comuni features the same colors. The gold symbolizes God in Roman Catholicism, while the maroon represents imperial dignity. This is the Official Associazione Sportivo Roma Away Short Sleeve Soccer Jersey from Kappa. 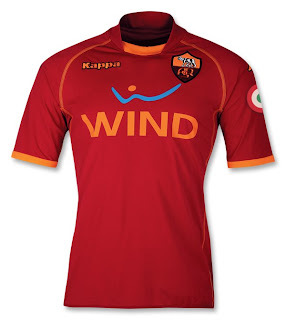 The Giallorossi are looking to get many victories away from home, and this is the shirt they'll wear to do it. Features the traditional away white. 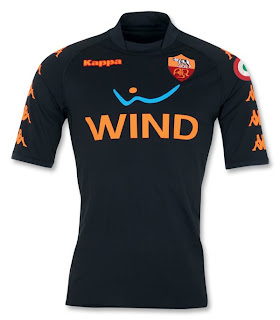 The Official Associazione Sportivo Roma Short Sleeve Third Soccer Jersey from Kappa. Giallorossi fans: this will make an excellent addition to your Roma closet. Cool navy shirt with bold Kappa logos running down both sleeves for an added touch of style. All three amazing jerseys include embroidered AS Roma team badge across the chest and Italy circle (which shows that AS ROMA won the Italian Cup in 2007) on left sleeve with screened sponsor designs and Kappa logo. Each shoulder also includes an embroidered Kappa logo. With its super stretchy fabric and advanced moisture-wicking materials this is a unique jersey which will give you amazing comfort no matter how long you play, train or cheer on your top Italian club.